The fastest Ubiquiti UniFi model with speeds of up to 300 Mbps in the 5 GHz radio band and up to 450 Mbps in the 2.4 GHz radio band. 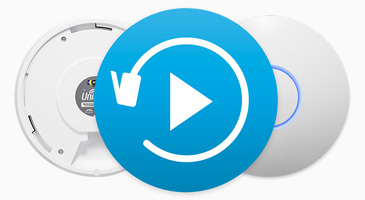 The UAP-Pro offers simultaneous dual-band operation with 2x2 and 3x3 MIMO technology. It has a range of up to 400 ft and 2 Gigabit Ethernet ports. TX Output is 30dBm in the 2.4Ghz band and 22dBm in the 5.8Ghz band. Sleek wall or ceiling mount design (all accessories included). The Ubiquiti Networks UniFi AP uses a clean industrial design that seamlessly blends into typical environments. 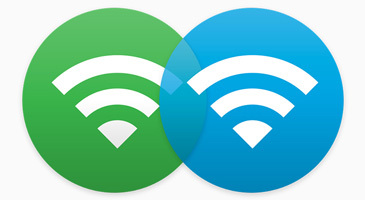 The AP's feature the latest in WiFi 802.11a/b/g/n MIMO technology. All accessories are included to mount the devices either on the wall or ceilings. Also included is Power Over Ethernet (POE) functionality which allows both power and data to be carried over a single Ethernet cable to the device. At the front-center of the device is a status LED ring which can provide the administrator with location tracking and alerts for each device. Featuring a clean industrial design, the UniFi AP can be integrated seamlessly into any wall or ceiling surface (mounting kits included). The LED indicator simplifies deployment and configuration. 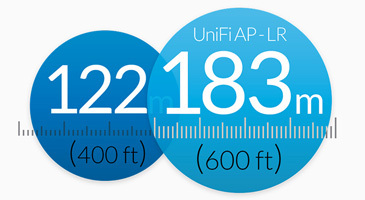 The UniFi AP-LR offers a longer range – up to 183 m – than the base model UniFi AP or UniFi AP-PRO. The UniFi AP-PRO supports up to 300 Mbps, 2x2 MIMO for the 5 GHz band and up to 450 Mbps, 3x3 MIMO for the 2.4 GHz band. 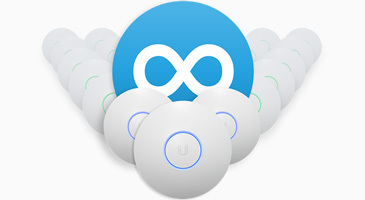 The UniFi Controller software is bundled with the UniFi AP hardware at no extra charge — no separate software, licensing or support fee. The UniFi Controller software is a powerful, enterprise wireless software engine ideal for high-density client deployments requiring low latency and high uptime performance. A single UniFi Controller running in the cloud can manage multiple sites: multiple, distributed deployments and multi-tenancy for managed service providers.